This section provides a roadmap to Manual Pages for SS7 Stack Manager (SS7 SM). This section provides a roadmap to Manual Pages for ISUP - ISDN User Part (ISUP). This section provides a roadmap to Manual Pages for Transfer Capabilities Application Part (TCAP). This section provides a roadmap to Manual Pages for Signalling Connection Control Part (SCCP). This section provides a roadmap to Manual Pages for Message Transfer Part (MTP) Level 3. SS7 Integrated Services Digital Network (ISDN) User Part (ISUP)[2..5] protocol layer that provides a Call Control Interface, cci(7), for ISUP operation, cci_isup(7), and an IO Control Interface, lmi_ioctl(4), for ISUP operation, isup_ioctl(4). 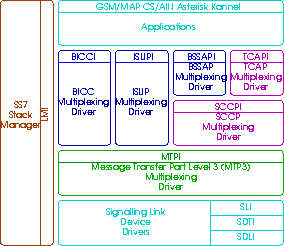 SS7 Bearer Independent Call Control (BICC) protocol layer that provides a Call Control Interface, cci(7), for BICC operation, cci_bicc(7), and an IO Control Interface, lmi_ioctl(4), for BICC operation, bicc_ioctl(4). SS7 Transaction Capabilities Application Part (TCAP)[7..11] protocol layer that provides a TCAP, tcapi(7), TPI interface, tpi(7), for TCAP operation, tpi_tcap(7), and XTI interface, xti(3), for TCAP operation, xti_tcap(3), and an IO Control Interface, lmi_ioctl(4), for TCAP operation, tcap_ioctl(4). SS7 Signalling Connection Control Part (SCCP)[12..16] protocol layer that provides an SCCP, sccpi(7), NPI interface, npi(7), for SCCP operation, npi_sccp(7), TPI interface, tpi(7), for SCCP operation, tpi_sccp(7), and XTI interface, xti(3), for SCCP operation, xti_sccp(3), and an IO Control Interface, lmi_ioctl(4), for SCCP operation, sccp_ioctl(4). SS7 Message Transfer Part (MTP) Level 3 protocol layer that provides an MTP, mtpi(7), NPI interface, npi(7), for MTP operation, npi_mtp(7), TPI interface, tpi(7), for MTP operation, tpi_mtp(7), and XTI interface, xti(3), for MTP operation, xti_mtp(3), and an IO Control Interface, lmi_ioctl(4), for MTP operation, mtp_ioctl(4). Signalling Link Interface, sli(7), module that can be pushed on a stream that conforms to the Signalling Data Terminal Interface, sdti(7). It also provides a Communications Device Interface, cdi(7), or Data Link Provider Interface, dlpi(7). for SS7 MTP2 Links. Signalling Data Terminal Interface, sdti(7), module that can be pushed on a stream that conforms to the Signalling Data Link Interface, sdli(7). Signalling Data Link Interface, sdli(7), module that can be pushed on a stream that conforms to the Channel Interface, chi(7). ACB56 V.35 card driver that provides a Signalling Data Terminal, sdti(7), interface. sl(4), modules can be pushed over this device to provide the MTP Level 3 Signalling Link, sli(7), interface. T400P-SS7 and E400P-SS7 4-span T1/E1 card driver that provides a Channel, chi(7), Multiplex, mxi(7), Signalling Data Link, sdli(7), Signalling Data Terminal, sdti(7), and Signalling Link, sli(7) interface. sdt(4), and sl(4) modules can be pushed over the sdli(7) device to form a complete SS7 MTP Level 2 signalling link, or the sli(7) interface can be used directly. T100P-SS7 and E100P-SS7 1-span T1/E1 card driver that provides a Channel, chi(7), Multiplex, mxi(7), Signalling Data Link, sdli(7), Signalling Data Terminal, sdti(7), and Signalling Link, sli(7) interface. sdt(4), and sl(4) modules can be pushed over the sdli(7) device to form a complete SS7 MTP Level 2 signalling link, or the sli(7) interface can be used directly. The devices isup(4), bicc(4), tcap(4), sccp(4), and mtp(4) might be opened indirectly when opening any of the SIGTRAN(4) equivalents: isua(4), bua(4), tua(4), sua(4), or m3ua(4). /dev/isup, /dev/bicc, /dev/tacp, /dev/tcap-tpi-cl, /dev/tcap-tpi-co, /dev/sccp, /dev/sccp-npi, /dev/sccp-tpi-cl, /dev/sccp-tpi-co, /dev/mtp, /dev/mtp-npi, /dev/mtp-tpi-cl, /dev/mtp-tpi-co, /dev/acb56, /dev/x400p, /dev/x400p-ch, /dev/x400p-mx, /dev/x100p, /dev/x100p-ch, /dev/x100p-mx. This manpage was written for strss7 release openss7-0_9_2_G(0.9.2.8). The OpenSS7 Project: Package OpenSS7 version 0.9.2 released Wed, 19 Nov 2008 02:38:20 GMT.